Update: Wow... Special thanks to everyone that attended the Twitter party yesterday. It was so much fun! We'll be announcing the winners of the twitter party shortly. Hey guys...today I'll be co-hosting a Neutrogena Twitter Party under the hashtag #WaveforChange. It's going to be filled with some great prizes, including three gift baskets valued at $200. 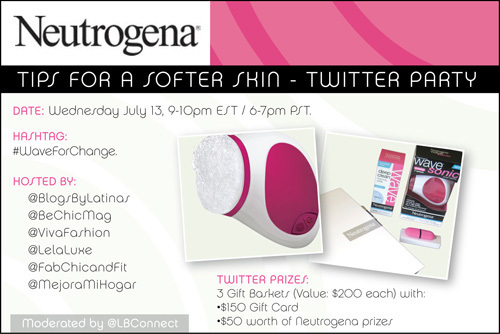 Plus we'll be sharing tips on how to get softer skin. Here are all the details. Hope you can join!! Where: On Twitter with the hashtag #WaveForChange. You can also use this customized TweetGrid(or TweetChat, Hootsuite, Tweetdeck, etc) to follow in all the action. RSVP here to let us know you will be going. A random winner will be chosen amongst those who answered correctly. Open only to residents of the United States. Void where prohibited.